Platinum and Silver and Gold, Oh My! As Herman Melville might have put it, the precious metals are spouting black blood and floating fin up. No doubt the astute readers of this blog are all short gold on the commodity exchanges, but I shudder to think of the gloom among the goldbugs today. The reason given for today’s drop of over $140 an ounce was “weakness in the Chinese markets.” Lame. The guys who come up with that stuff are just one step above editorial writers. Great shades of 1979-80 dear reader, when the Hunt brothers cornered the silver market, only to have the government change the rules on them in mid-stream. Have you ever read Mark Twain’s Roughing It? The times were just like that. Money was lying in the street. I was a graduate student at the time, and financed my education by collecting silver from the small dealers in town and running it to the big dealers who were paying top dollar. It was worth it to the little guys, because they were able to keep their shops open while I did the leg work for them. One time I took a load of scrap gold to a dealer in Flatbush. It took us all day to “clean” the gold. We had to remove any small bits of foreign material, and then the dealer would check the gold with his “stone.” It took us until about 1:30 A.M. to go through it all. I was paid in cash: over $100,000. The dealer called a cab to take me to the airport, but I had missed my flight by then. I walked into one of the airport hotels in my scruffy student garb, with a beat up backpack containing over 100 large in cash. The guy in the lobby quoted the room price, looking at me dubiously, as if I couldn’t afford it. Little did he know. In those days the dealers used to ignore diamonds when they were buying gold, so you could pick them up for a song. I became a “diamond dealer” on the side, and learned to appreciate the beauty of D color flawless stones. They’re awesome. After you’ve seen a few hundred of the off-color, carbon-spotted rocks they put in jewelry, looking into the perfect heart of one of them with a loupe is a spiritual experience. One time a dealer gave me a stone to irradiate in my university’s experimental nuclear reactor. He was happy with the results, as it turned out a beautiful chartreuse green after neutron bombardment. I had to caution him to set it aside for a few days until the activated gold that the diamond had absorbed had decayed. In January 1980 the rules were changed so that you couldn’t insist on delivery of physical silver to cover your longs in the futures market. For a while, the market didn’t seem to realize what happened, and charged ahead on momentum. Then it went down limit every day for about two weeks. That meant that, if you were caught holding a long, you were wiped out. It was the greatest thing that ever happened to the little guy. They were standing in big queues, waiting to sell their silver coins, sterling, etc., in front of all the coin shops. They all got top dollar, and then the big dealers were left holding the bag. A lot of them went belly up. A lot of beautiful pieces were melted down for their silver in those days. I remember one in particular that a local coin dealer had somehow managed to purchase. It was a massive inkwell with beautifully sculptured angels, all in .835 Latin standard silver, commemorating the union of Austria and Hungary in the compromise of 1867. How it ever got to this country I’ll never know. An antique dealer who knew its significance was trying to buy it, but the silver value was so high that it was touch and go. Eventually, he managed to save it, but took a huge hit in the bullion value in the process. After several months, the gravy train was over. 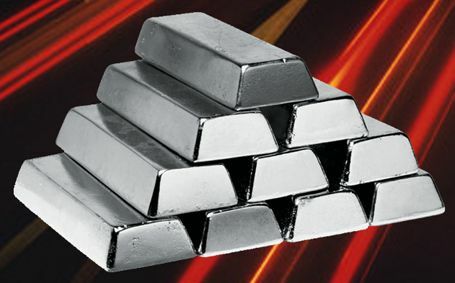 I went back to my studies, and silver sank to about $5 per ounce, where it stayed for many years. It’s finally risen from the grave. Who knows when the bubble will burst this time around?